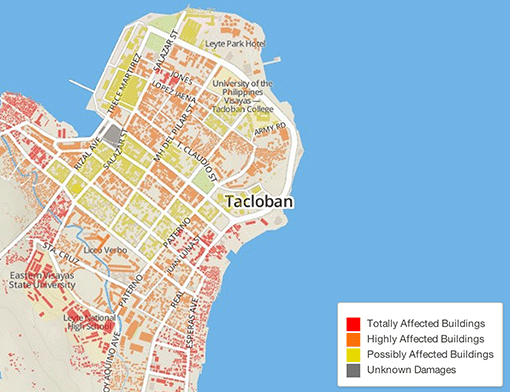 The OpenStreetMap (OSM) initiative has been using volunteer contributions to try and create a detailed map of the areas affected by Typhoon Haiyan in the Philippines. Since November 7, more than 766 volunteers have been working to put together this map, according to the World Bank. You can find out more about the OSM initiative here. 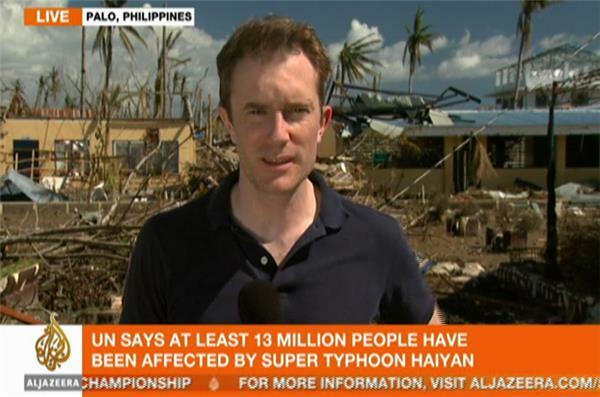 Al Jazeera's Harry Fawcett has been reporting live from a school in the town of Palo, outside Tacloban, this morning. 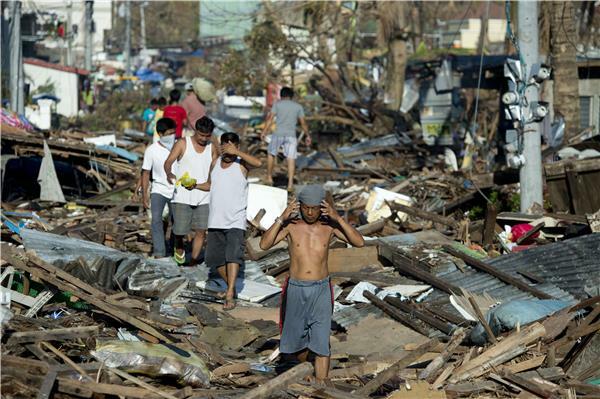 "This is just the remnants of this elementary school, which was serving 405 pupils until the typhoon hit on Friday. As you can see, so much of this coast has just been entirely demolished and this school certainly wasn't spared. We've been talking to the principal here, and he's been here everyday, guarding this school, waiting for some kind of government assistance or at least a face from the government to come in and evaluate whats happened here. He says that no-one has come. But there is this date now that's been set for January 15, for schools up and down this area to reopen and for students to go back to classes. The principal here says that's unrealistic given the fact that he's been here more than a week and there's been nothing yet done to try and recover the situation here at this school. "We were talking to other people about the same issue in Tacloban earlier on, and they were saying that really more people are just thinking about just getting out of this area entirely, rather than trying to provide education for their children here in this area. They are thinking that for their children's futures it makes more sense perhaps to migrate. "Also, we were in another school which is now an evacuation centre. One room has been set aside for what they call stress debriefings, there's a social worker there who says that they have set up a sort of classroom style environment for children to come, and they don't really go for a school day, but they go for a short while just to draw pictures, sing songs and kind of in some ways deal with what's happened." Regarding the government's response, and particular the optimistic timelines being offered for a return to normalcy, Fawcett said that while that was the case, the government was also caught in a difficult situation. "There has been alot of anger and criticism, and the government itself has admitted that they've fallen short in certain areas. In a sense, though, they're sort of damned if they do and damned if they don't. If they don't say that we're going to try and get this place back up and running and give some sort of symbol of normal life returning, then the government would face accusations of doing too little. But at the same time, when they're talking about putting in ATMs and getting businesses back up and running ... then they face the potential accusation of getting ahead of themselves."